The glamorous art and antiques fair Masterpiece London has returned to Chelsea for the eighth year in the row. Bringing buyers and viewers the finest works of art from past to present, the fair attracts the most distinguished clientele in London. Artists, collectors and even some celebrities descended upon the Royal Hospital Chelsea to soak up some culture and view the unique cross collection of art sourced from all over the globe. From fashion to interior, sculpture to paintings, we have rounded up our top picks from Masterpiece 2017. This piece, commissioned by Paul Kasmin Gallery for Masterpiece, welcomes visitors to the fair. 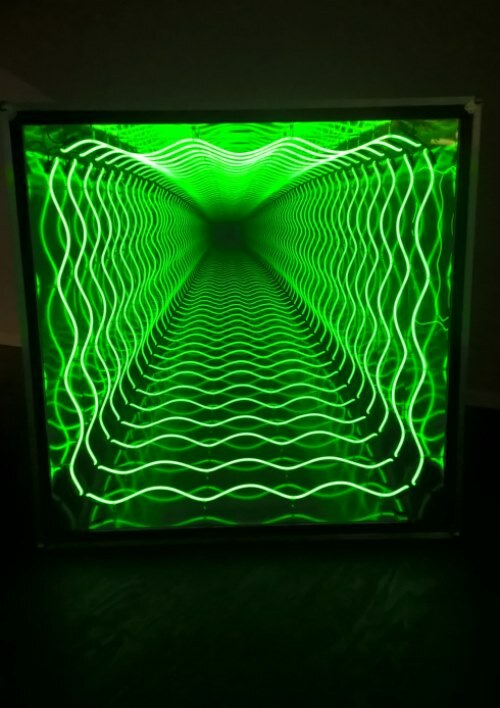 Designed by one of the world’s leading artists, Ivan Navarro, the installation is in keeping with the 21st- Century trend of interactivity, inviting guests to get lost in it. The six blocks, each two metres high and wide, are constructed of neon, aluminium, mirror, a one way mirror and electric energy. The green neon lights make up a square which is reflected in the mirrors for what feels like forever. This presents the illusion that if you stepped into the piece you would become trapped in a never ending tunnel. When approaching Verhoeven’s beautiful sculpture there is the sense that if you get too close it might burst. 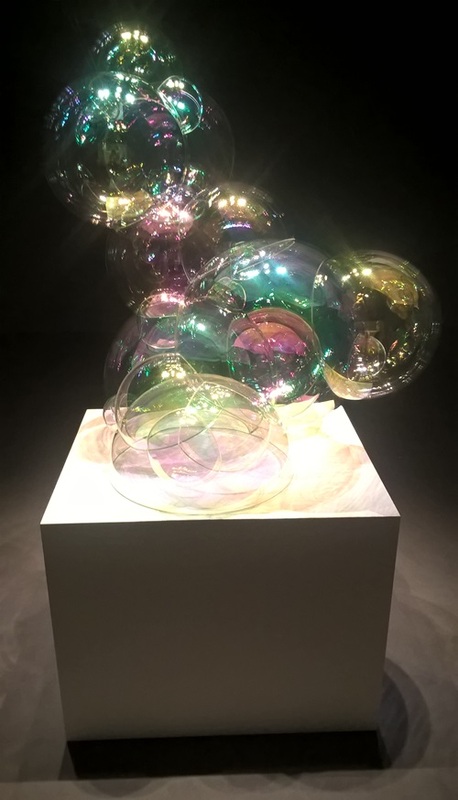 Luckily, the sculpture is actually made of prismatic glass, used to create the giant bubbles reminiscent of those you used to chase and pop during childhood. The piece combines technology with art. Using borosilicate glass, an exceptionally strong and shock resistant material, Verhoeven is able to permanently capture an image of brevity and the result is mesmerising. Entitled Informazioni mangiato il mio tavolo translation: Information ate my table, Zachary Eastwood Bloom literally used a computer to make this stunning sculpture. 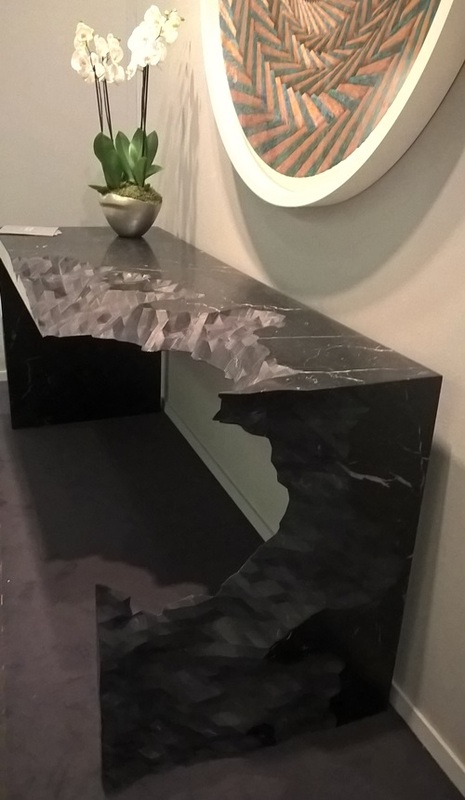 Zachary, a ceramics specialist from Leeds, uses a 3D Printer to cut shapes into traditional materials like marble, wood, and clay to create an effect which successfully brings the past into the present. Although a lot of his work is done on screen, the end result is something much more tactile. Information ate my table blurs the line between the digital and material. 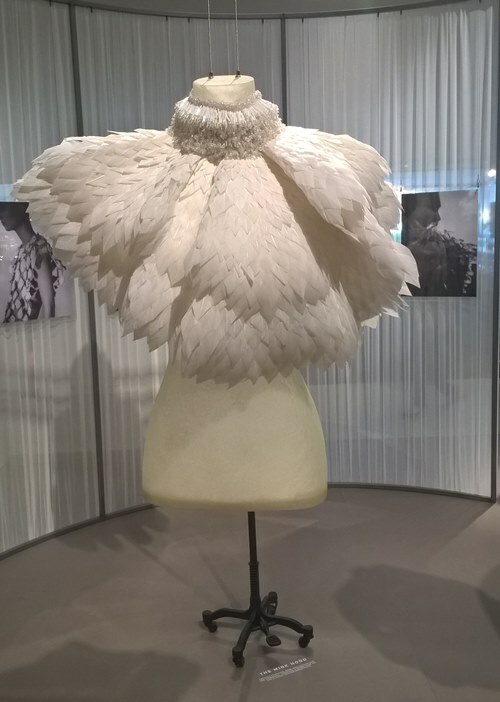 Korean born Chun Kwang Young is seventy years old and going strong as his recent collection Aggregation proves. However, as a child he was sickly and attended the doctors regularly. Across Asia it is common practice for doctors to wrap up medicines in mulberry paper, a material that is not dissimilar to cotton but is a lot stronger. It is this mulberry paper that you see in Young’s work. 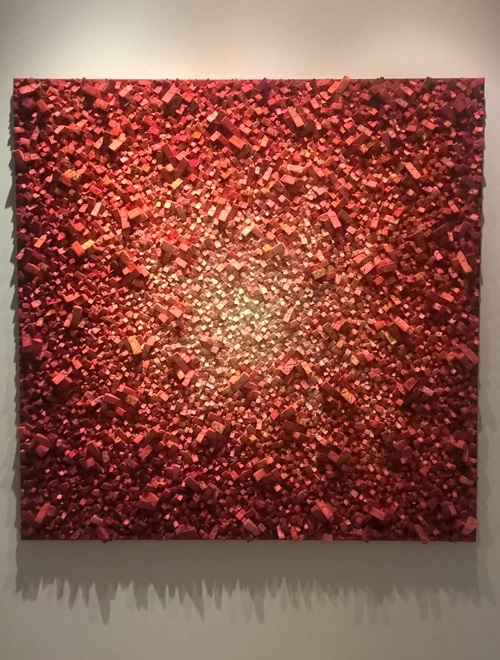 He creates his multimedia creations by covering hand cut pieces of Styrofoam in mulberry paper on which various people have written pockets of information. He then colours the paper using a dye and attaches the individual packages to a canvas. The result is captivating.